GABORONE, BOTSWANA, Nov 24 2015 (IPS) - A perfect storm of lower rainfall and a growing population beckons for Botswana. But others find climate change is already in the fields and paddocks. “As climate change ushers in more stress on the water sector, it is increasingly a concern that losses in rangeland productivity will result in food insecurity, especially in rural areas,” a country analysis report unveiled recently on Botswana states. Far from the airy conference rooms where such reports are typically shared, are thousands of subsistence farmers – growing crops mainly to feed their families – for whom these words come to life in the fields and the paddocks of Botswana every harvest season. For these farmers, the national ideals of poverty eradication and sustainable development are slipping ever further out of reach. Bathalefhi Seoroka, 65, is a subsistence farmer in Boteti, one of Botswana’s drier areas located in the central region. She mostly grows maize, sorghum, beans and melons on her six-hectare field. 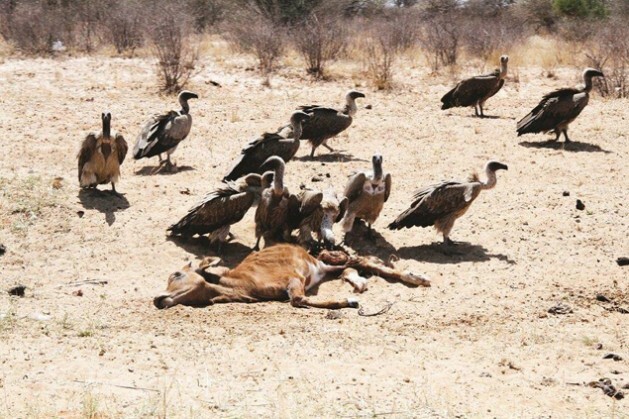 The Department of Meteorological Services predicts the southeastern part of Botswana – which is already suffering from drought and water shortages – is poised to experience its driest season in 34 years. To cope with food shortage risks, the Botswana Agricultural Marketing Board (BAMB) ordered 1,000 tons of yellow maize from South Africa, and an additional 10,000 tons of white maize is due to arrive soon. BAMB spokesperson, Kushata Modiakgotla says strategic grain reserves currently stand at 30,000 tons of sorghum and 3,000 tons of cowpeas left, but there is no maize. “BAMB has started the process of buying 5,000 tons of white maize from Zambia and it is exploring other avenues to import an additional 5,000 tons if necessary,” she states. Imports from both nations would help meet supply as local reserves are under threat, while yellow maize is used to produce animal feed. The government insists consumers are not in any danger of going hungry as more than 90 percent of the maize consumed in Botswana is sourced by local millers from South Africa. But despite the supply contracts, consumers will have to pay more for maize meal the longer drought persists. Botswana Meat Commission (BMC) chief executive Akolang Tombale says climate risks also present challenges to beef production and exports. “We are just emerging from a very dry season and if another drought is forecast it is a problematic state as production will be reduced,” he explains. Grasslands and pasture are an important resource for Batswana who derive most of their livelihood from livestock. The majority of the BMC’s throughput starts at natural pastures, before being prepared with feedstock. Tombale is holding out hope for showers to replenish pastures around the country, but he acknowledges this may not be a long-term solution. BMC has been receiving higher rates of deliveries than usual this year, since the Ministry of Agriculture advised farmers to destock as means of cutting their losses. However, this is a short-lived gain because if the situation persists in the next raining cycle, beef revenues would be badly affected. The BMC is now urging farmers to change their approach from quantity to quality-based cattle production. President Ian Khama recently urged farmers to adopt more innovative approaches to their work in order to cope with the impacts of climate change. Speaking at the 2015 National Agricultural Show ‘Practicing Smart Agriculture to Combat the Effect of Climate Change’, he pointed to Israel, where farmers have harnessed new technologies in order to maintain production in highly water stressed environments. “This ravaging drought we are currently experiencing is an opportunity to be innovative and resort to new methods and technologies to produce under such conditions. It is for this reason that farming methods such as conservation agriculture are promoted,” he said. Recommendations include using improved crop varieties that are drought tolerant and high yielding, investing in breeds that can withstand the current climate, as well as adoption of proper crop husbandry practices though agricultural infrastructure. Lare Sisay, United Nations Development Programme’s deputy resident representative, predicts water shortages will lead to an increase in undesirable types of grass species. “This has a far-reaching impact on social and economic sectors, and this has not yet been quantified and factored into the country’s economic projections,” he says. He predicts this could derail Botswana’s efforts to break through its middle-income country status. Parliamentarians – many of whose constituents are rural and peri-urban populations involved in communal farming – are expected to tackle the climate change policy, once it appears in the National Assembly. The policy is due in the November sitting and already momentum is gathering from activists to ensure robust debate and urgent approval. This story was sourced through the Voices2Paris UNDP storytelling contest on climate change and developed thanks to Jessica Shankleman from @BusinessGreen.